Christophe Royer, Algerian born Frenchman Chef and Owner of this canal-side eettempel, certainly isn�t modest when it comes to the restauranteur game. Not merely content to practice his impressive talent for traditional French cuisine his is a menu that embraces all aspects of world cookery. His restaurant boasts an extraordinary menu inspired by Mediterranean cultures, prepared with a dash of US and Asian technique and more than a nod towards the spices of middle east and Africa, a versatile schmorgasboard that is fully deserved of it�s Michelin star rating. One cannot help but think that if Royer had stayed put a few hundred miles to the south then he would have attained greater recognition for his efforts. But that is not his style, as in Amsterdam, a city with an ethos of experimentation and originality, he is free to develop his craft how he wishes, devoid of the strict hierarchy and rules that are gospel in the kitchens of France. The ever-changing menu -- always loaded with vegetarian options -- may include entr�es such as roasted lobster with soft garlic and small "la ratte" potatoes, or sweetbreads of veal with rosemary, asparagus, and compote of preserved lemon. Wines are finely chosen to deftly accentuate and add to the meal itself rather than detract your focus from it. 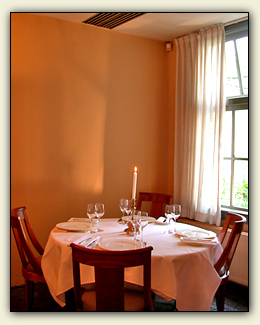 A quiet setting with dark wood and thick carpets make Christophe the perfect place for a romantic evening.